In a new paper, Maximilian Fochler conducted a series of structured interviews with scientists to make an STS point: when we think of capitalism as a system that depends on “accumulation,” there are many different kinds of things that one can accumulate, many of them non-financial. I think Fochler makes an important point, but I also think it should be pushed in a somewhat different, more critical direction. First, though, the results of the interviews. Fochler interviewed both academic and non-academic scientists in Austria. On the academic side, he looked at those in charge of labs, and the post-docs who do most of the actual bench science. Both are engaged in a race to accumulate. The leaders have to produce peer-reviewed publications in order to get grants, which they need to then get more peer-reviewed publications (Fochler’s interview subjects were Austrian, but it should be noted that in this country, many of those scientists have to get grants to cover their salary. No grant, no paycheck). The post-docs are in perhaps the most dire situation: there are a lot more post-docs than there are positions for them, and so they have to engage in a competitive race to accumulate publications as well, in order to continue in their careers (or as Becker would say, adding a polite veneer, “invest in their human capital”), either by extending their current position or gaining another one. Adding to the stress, postdoc positions typically last 2-3 years, which is not enough time to accumulate a significant publication record (I will leave it to readers to draw the connections between this situation and that faced by the humanities precariat). On the corporate side, we find the CEO’s of start-ups trying to generate peer-reviewed publications, positive lab results, and other indicia that their particular research program – and its endpoint product – is worthy of continued venture capital funding, with the goal of (eventually) selling the start-up to a larger pharmaceutical company. Since the scientific process apparently takes about 10 years, and the VC funding cycle is two or three years, this is a continuous worry. The scientists, on the other hand, much to their surprise (and mine, as I read the paper) work in a collaborative, non-competitive environment. This is because successes and failures are attributable to the entire company. Of course, the downside of this is that these scientists don’t accumulate anything they can use to parlay into their next job. The simple point I would like to add is that, despite all of the accumulation, no one is making any real money. Not the post-docs, especially, though a move into to a faculty position adds some salary and a little job security, but also adds to the need to publish. The CEO’s and employees of the start-ups aren’t likely to get rich either: 90% of start-ups fail generally; pharmaceuticals don’t do that much better; and one study reported that “97% of drugs in preclinical tests never make it to market, and nor do 95% of the molecules in phase 1 clinical trials and 88% of molecules in phase 2. Not until phase 3 do their prospects get much better: Of the ones that make it that far, 56% are approved” (summative quote from here). Big Data theorists have, for a while, been warily eyeing the growth of the “Internet of Things” (IoT), which is when “smart” technology is integrated into ordinary household devices like refrigerators and toasters. New fridges all have warning lights that remind you to change the water filter; IoT fridges will order the new filter for you. “Smart” utility meters are another example: they can monitor your utility usage moment by moment, making adjustments, say, to the HVAC to optimize power (or to prevent brownouts by automatically raising the temperature of everybody’s house a degree or two during peak hours). Such smart meters are obviously key if those with rooftop solar are going to sell their surplus capacity to the power company. They also enable very detailed surveillance of people’s home lives: they apparently know when you’re using power for the dishwasher, the shower, the TV, and so on. Capital knows opportunity when it arrives; if your dishwasher is using more power than the average dishwasher, expect advertising for a new, energy-efficient model. If you routinely have lights on until very late at night, maybe you need some medicine to help you sleep, delivered to your web browser. Your boss sees opportunity as well: if you routinely disarm the alarm, turn on the lights and open the fridge at 3:30am, maybe you’ve been out clubbing too late to be a good worker, and you need to have your desk cleared by 5:00 today. This inference will be assisted by the fact that clubs now keep networked electronic records - ostensibly for security purposes - of who goes in and out (and who is banned: if you get thrown out of a club, all the other clubs on that network can refuse you entrance). What if your boss buys the data from the club networks, and the utility company and crunches it to measure productivity? Or, sells it to the insurance company, where you’re told that your new wellness initiative requires you to allow your devices to report that you come home and stay there by midnight every night, under penalty of punitive premiums? Your auto insurance bill will almost certainly go up too, because you’ll have installed the vehicle tracking devices that will, by then, be necessary to avoid punitive insurance rates. But all of that is about surveilling the human. In a fascinating new paper, Kevin Haggerty and Daniel Trottier extend the study of surveillance to nature, noting that the practice is both pervasive and growing, on the one hand, and nearly completely ignored, on the other, with the partial exceptions of Latour and Haraway. I suspect that this is a paper destined to have a big impact; Haggerty in particular is a very significant surveillance theorist, and in a 2000 paper, he and Richard Ericson made a very influential push to orient surveillance studies around the Deleuzian notion of an “assemblage,” arguing that the Foucauldian “panopticon” had become dated. In the current paper, Haggerty and Trottier look at several ways that we now surveil nature that they expect to grow exponentially with developing technologies. None of them are exactly new, but things like RFID tags will make them a lot cheaper, easier, and more commonplace: the representation of ever-more-remote aspects of nature, often turning it into spectacle; using animals as agents (for example, as the Germans did during WWI, attaching cameras to homing pigeons); the increased use of biosentinels (where we rely on an animal’s response to the environment to infer information about that environment. The canary in the coal mine or the drug-sniffing dog are the textbook examples); and taking surveillance inspiration from nature (looking at insect eyes to develop cameras that can see a full 360 degrees, for example). They then suggest three implications for research into surveillance: (1) there are non-technological aspects of surveillance that need highlighting and study; (2) not all surveillance is of humans (contrary to what most of the literature talks about); and (3) we need to look carefully at inspirations for surveillance. They close by highlighting that the human/nature boundary has never been a particularly bright one, and it’s likely to get less so as we move on. Foucault’s account of parrhēsia shows why it would have little critical traction today. In Foucault’s analysis, parrhēsia has both a political and an ethical phase; Cynicism is the most radical version of the ethical phase. The primary characteristic of Cynical parrhēsia is full visibility, something which Foucault does not endorse but which neoliberal biopolitics actively demands. More fundamentally, ethical parrhēsia fails as a resistance strategy because branding capital blurs the boundaries between affirmations of capital and its critique, enabling the full cooption of parrhēsia-as-visibility into the process of branding. Our problem is a lack of politics. In addition to more textual work, the main additions are probably to the section on capital and branding, where I use the pharmaceutical industry as an example (drawing from this book by Phillip Mirowski. You should pour a stiff drink before starting). I also engage in the conclusion with an important paper by Kelly Happe on OWS (I discuss a different aspect of that paper here). In critical work on neoliberalism, there’s probably two or three main schools of thought. One approaches the subject as a matter of political economy. David Harvey, whose analysis is explicitly Marxian, is the most well-known figure in this approach; another prominent author in that camp is Philip Mirowksi. The other major school is broadly Foucauldian, taking its cue from Foucault’s Birth of Biopolitics lectures. A third group, represented by autonomist Marxists like Paolo Virno, Franco Berardi, and of course Michael Hardt and Antonio Negri, attempt a synthesis (I won’t have much to say about them here). All sides have methodological critiques of the other; here I just want to note that the Foucauldians generally tend to be concerned with a topic that seems neglected in political economy: granted that neoliberalism expects us all to behave as homo economicus, defined as a risk-calculating, utility-maximizing investor in himself (gendered pronoun deliberate), how does neoliberalism get people to actually do this? After all, it is not a natural human set of behaviors. More specifically, not just how does neoliberalism get people to do this, but how does it get them to do so enthusiastically, treating the definition of the human as homo economicus as the true, correct and only way to be human? In other words, Foucauldians insist that critiques of neoliberalism need an account of subjectification. Wendy Brown’s new(ish) Undoing the Demos: Neoliberalism’s Stealth Revolution (Zone Books, 2015) makes a substantial contribution to the Foucauldian camp by focusing on “Foucault’s innovation in conceiving neoliberalism as a political rationality” (120). The political rationality is “governance” as “the decentering of the state and other centers of rule and tracks in its place the specifically modern dispersal of socially organizing powers throughout the order and of powers ‘conducting’ and not only constraining or overtly regulating the subject” (125). But then there’s this: “in an unusual turn, however, Foucault’s ‘orient’ seems to include the Greco-Roman world as well as the modern Eastern one, since the contrast he draws is primarily between tradition and modernity rather than East and West as such” (Afary and Anderson,18). He then urges that this is not the same as political power, the power used to educate children, nor is it persuasion (“in short, the pastorate does not coincide with politics, pedagogy, or rhetoric” (164)). The pastorate does not disappear with the rise of modern power forms, as he emphasizes in a couple of places (STP 148, 150). Indeed, he makes a much stronger claim: “I think this is where we should look for the origin, the point of formation, of crystallization, the embryonic point of the governmentality whose entry into politics … marks the threshold of the modern state” (165). The present paper looks at the intersection of juridical and biopower in the U.S. Supreme Court’s school desegregation cases. These cases generally deploy “equitable relief” as a relay between the juridicially-specified injury of segregation and the biopolitical mandates of integration. This strategy is evident in the line of cases running from Brown to Swann v. Mecklenburg, and has its antecedents in pre-war economic regulation. Later cases have attempted to close this relay, confining equality and rejecting claims of equitable relief. Study of the school desegregation cases thus both shows an example of the intersection of biopower and law (which has been difficult on Foucauldian grounds), as an example of the biopolitical race war that Foucault identifies in Society must be Defended. As Melinda Cooper notes (recall here), one of the reasons Gary Becker – as opposed to other neoliberal theorists – was interesting to Foucault because of his emphasis on microeconomics, particularly the quotidian institutions through which micropower functions, such as the family. At the same time, Becker’s human capital theory has become increasingly important in neoliberal constructions of human nature. In a late essay, Becker applies himself to health economics. The result, I think, offers a very clear demonstration of neoliberal thinking and how it works nearly inexorably to distract from social problems, generally by constructing them as individual problems and ignoring the social determinants of an individual’s situation. In her contribution to recent the Vatter/Lemm-edited collection of essays on biopolitics, Melinda Cooper argues that Foucault’s work on neoliberalism needs to be read in the context of his interest in the Iranian revolution. If she’s right, this stands current complaints about Foucault’s engagement with neoliberalism on its head. The standard complaint about the work on biopolitics is that Foucault ends up supporting (deliberately or otherwise) neoliberalism. The merits of that claim have been debated ad nauseam, particularly in light of the Zamora book last year, and I have no interest in revisiting them here (plus, Vatter’s paper in the same book does a great job on the topic, and I think he ups the bar considerably for future discussions). Cooper’s paper is of interest because she makes what is essentially the opposite claim: Foucault was so disturbed by the general diffusion of the oikos into the polis that defines neoliberalism (and really classical liberalism, too) that he found the Iranian revolution interesting precisely because it focused on restoring some sort of classic oikonomia. There’s thus two main steps to the argument in its most condensed form: (a) The Iranian revolution was premised on getting women out of the public sphere after Shah Pahlevi introduced a number of reforms that greatly expanded their integration into the full economy; and (b) Foucault thought that it would be a good thing if there was some sort of restoration of the law of the household as a bulwark against neoliberalism. We don’t access the internet directly – it’s always through some sort of intermediary software. For that reason, it matters – a lot – what the intermediary does, and what kind of interactivity it promotes. Concern about this dates at least to a 1996 (published finally in 2000) paper by Lucas Introna and Helen Nissenbaum called “Why the Politics of Search Engines Matters.” More recently, Tarleton Gillespie has emerged as a major voice in these debates: his book, Wired Shut, makes a strong case against Digital Rights Management techniques, and his more recent “Politics of Platforms” makes an argument analogous to Introna and Nissenbaum’s for programs like Facebook. Indeed, internal FB studies seem to bear these concerns out: Facebook discovered that it could influence voter participation with simple “get out the vote” reminders sent to some users but not others. The results could easily swing a tight election. Gillespie and Kate Crawford have a new paper out that makes the argument in the context of “flagging” content. Where did Biopower Come From? Foucault made a big deal in the lectures contained in Security, Territory, Population of the linkage between medieval pastoral power and modern governmentality. Although there have been skeptics – most notably Mika Ojakangas, who thinks Foucualt reads the ancient sources nearly backwards: it was the Greeks and Romans who practiced eugenics, and Jewish and Christian authors who opposed them – it’s certainly a narrative that has the feel of doxa. "We can say that the idea of pastoral power is the idea of a power exercised on a multiplicity rather than on a territory. It is a power that guides towards an end and functions on an intermediary towards this send. It is therefore a power with a purpose for those on whom it is exercised, and not a purpose for some kind of superior unit like the city, territory, state or sovereign …. Finally, it is a power directed at all and each in their paradoxical equivalence, and not at the higher unity formed by the whole" (STP 129). The problem is that there is another Foucauldian narrative about governmentality. You see it in his Rio lectures of 1973 (“Truth and Juridical Forms,” in the Power anthology). But it’s even more evident in his “Lives of Infamous Men” (also in Power, the pagination to which I will refer) (these texts are both slightly before STP). The legal doctrine of substantive equality – roughly, that one look at not just the presence of stipulated, formal equality, but that one incorporate outcomes as relevant to whether or not equality has been reached – strikes me as a biopolitical concept, whereas its more formal counterpart is more juridical. Consider the right to abortion: a formal declaration that a woman has the right to terminate a pregnancy prior to fetal viability exists whenever laws do not prohibit the termination. Recent state laws that ban all abortions after a gestational age of 20 weeks run afoul of that right, because a fetus at 20 gestational weeks is not viable. On the other hand, if the right is substantive, then it matters whether women can actually take advantage of the right. State laws that require spousal consent, for example, were declared by the Court in Planned Parenthood v. Casey to place an “undue burden” on the exercise of that right. That’s a decision based on substantive equality, and it treats women not (just) as juridical subjects possessing abstract rights, but as agents in the world trying to achieve the outcomes that such rights are (presumably) designed to allow. Current rounds of state restrictions on abortion, such as forced transvaginal ultrasounds (on the pretext of ensuring the woman is “fully informed”) or the demand that clinics look like hospitals (for the “safety of women”) seem designed to limit the substantive right to abortion, while preserving it formally. All of that is a rough-and-ready way of putting the distinction, and there may very well be any number of equality claims in particular where the substantive version doesn’t sound particularly biopolitical. That’s ok – in what follows, I want to look at education, and to propose that claims of substantive equality, even biopolitically-oriented ones, can differ dramatically in what they claim and how they claim it. One of the notable features of Brown v. Board of Education is its reliance on social science evidence indicating the psychological harm of segregation to black children (this is the famous “footnote 11,” which cited a number of recent studies). In his reflections on Brown, Robert L. Carter, one of the attorneys who argued the case, noted that “we assumed … that educational equality in its strict educational connotations – with its emphasis on the quality of education – was the same as educational quality in its constitutional dimensions” and notes that, in a series of earlier cases, “we turned to expert testimony for the first time,” and supported the argument with two kinds of claims: by “measuring the physical facilities of the proposed black law schools against the existing university holdings and by taking into account the adverse psychological detriment that we contended segregation inflicted on blacks – all of which resulted in a denial of equal education” (Bell, ed., Shades of Brown, p. 22). The three cases prior to Brown were Sweatt v. Painter, McLaurin v. Oklahoma, and Sipurel v. Oklahoma. Let’s take them in reverse chronological order. In the current issue of Philosophy and Rhetoric, Kelly Happe has an interesting paper interpreting Occupy Wall Street (or at least the Zuccotti Park component) as an example of cynical parrhesia. In a time when all expression is always already co-opted by neoliberal capital as a source of surplus value (this point has been canvassed extensively by the autonomist Marxists as “complete subsumption,” and I’m going to take it for granted here. I summarize it here in my discussion of Hardt and Negri’s Empire), it becomes hard to know what kind of speech would count as protest. Anyone who has seen the branding of Che Guevera T-Shirts has some idea what the problem is. It’s also one that has been very difficult to address; in Empire, for example, which lays out the problem quite clearly, we are offered the somewhat discouraging example of Coetzee’s Michael K, a character who drops out and nearly starves to death in caves. One of my summer projects is to work up my SPEP paper from last year, which used the school desegregation decisions (like Brown v. Board) as a way to think about the relations between juridical power and biopower in the courts. The role of the courts in the transition from hegemonic juridical power to hegemonic biopower hasn’t been studied a lot, and the tendency is to dismiss the courts as institutions along with juridical power. The centrality of the judiciary in school desegregation convinced me that there’s more to be said, however. Current litigation about whether corporate entities can use rights claims to deny contraceptive insurance coverage to their female employees seems to bear that intuition out. So I’ve been reading, and one thing that didn’t particularly strike me until now is the complexity of the relation between school desegregation policy in the U.S. and what Foucault calls a “race war” at the end of Society must be Defended. Unlike Derrida, with whom he had frequent, highly public polemics, Foucault says relatively little about Heidegger. Much of that is incidental: in a 1983 interview, for example, while talking about the postwar influence of Sartre, he notes parenthetically that “the roots of Sartre, after all, are Husserl and Heidegger, who were hardly public dancers” (Aesthetics, 452). In his 1982 lecture on the “Political Technology of Individuals,” Heidegger’s name shows up in a list of those who are in the “field of the historical reflection on ourselves” (Power, 402). But, in a late interview, he says that “my entire philosophical development was determined by my reading of Heidegger” (see the discussion here). He makes a comparable remark in one of the Hermeneutics of the Subject lectures; in response to a question, he names Heidegger and Lacan as the two 20c thinkers who have dealt with the subject and truth, and says that “I have tried to reflect on all this from the side of Heidegger and starting from Heidegger” (p. 189). What are we to make of this? The limited point I wish to make here is that there is also evidence in Foucault’s last lecture course, The Courage of Truth (CT), of an engagement with Heidegger. I suggested in an earlier post that there was a specific “parting shot” at Derrida; the evidence for engagement with Heidegger is along the same lines: he doesn’t name names, but it’s pretty clear what he’s talking about. The references matter because they some of the luster off the idea that Foucault continued to get that much out of Heidegger. At the same time, I think they establish that Foucault is not only interested in Heidegger as an existentialist. Aret Karademir makes that case, aligning an existentialist reading of Heidegger with an existentialist account of the late Foucault, specifically aligning the two of them on the idea that the sort of creation of oneself as a work of art in late Foucault strongly parallels Heideggerian authenticity. The argument here is specific to the post-Kehre Heidegger. I’ll argue that Foucault’s Cynic would get the Heideggerian stamp of approval in this post, but then that this indicates Foucault’s disapproval in the next. Foucault’s last lecture courses at the Collège de France – recently published as The Government of Self and Others [GS] and The Courage of Truth [CT] – are interesting for a number of reasons. One is of course they offer one of the best glimpses we have of where his thought was going at the very end of his life; he died only months after delivering the last seminar in CT, and there is every reason to believe that he both knew that he was dying, and why. There’s a lot to think about in them, at least some of which I hope to talk about here over a periodic series of posts. Here I want to say something introductory about the material, and look at Foucault’s critique of Derrida in it. The lectures contain a sustained investigation of parrhesia, the ancient Greek ethical practice of truth-telling. “Truth to power” is the closest modern term we have for such a practice, though you don’t have to get very far into the lectures to realize how richly nuanced the topic is, and how many different ways it manifest itself in (largely pre-Socratic) Greek thought and literature. The lectures also contain a number of references to contemporary events and people (from the beginning: GS starts with Kant, before going back to the Greeks), and it’s hard to put CT down without a sense that, had there been another year of lectures, Foucault would have been more explicit in assessing the implications of the study of Greek parrhesia today. I am now back to working on my conceptual genealogy project; this post is the fifth installment of a series of posts on the project. Part I is here; Part II.1 is here; Part II.2 is here; Part II.3 is here; a tentative abstract of 2 years ago, detailing the motivation for the project, is here. I hope to have argued more or less convincingly by now that, given the specific historicist conception of philosophical concepts I’ve just sketched, genealogy is a particularly suitable method for historically informed philosophical analysis. In the next section, a few specific examples will be provided. However, and as mentioned above, I take genealogy to be one among other such historical methods, so there are options. Why is genealogy a better option than the alternatives? In order to address this question, in this section I pitch genealogy against one of its main ‘competitors’ as a method for historical analysis: archeology. Naturally, this confrontation leads me directly to Foucault. Responses to Zamora's "Can We Criticize Foucault?" Daniel Zamora’s interview in Jacobin (following the publication of a book he edited), in which he claims that Foucault ended up de facto endorsing neoliberalism, has generated a lot of renewed discussion about Foucault’s late work. Over at An und für sich, Mark William Westmoreland has organized a series of posts responding to Zamora. I’m one of the contributors; the others are Verena Erlenbusch (Memphis), Thomas Nail (Denver), and Johanna Oksala (Helsinki). My contribution is cross-posted below, but you really should start with the interview and then read Erlenbusch’s post – she lays out the context of the controversy, and discusses the book (which came out fairly recently, and which hasn’t been translated yet) in considerable detail. I’ll update with links to Nail’s and Oskala’s contributions when they’re up. UPDATE 1: Here's the link for Johanna Oskala, "Never Mind Foucault: What are the Right Questions for Us?" And for Thomas Nail, "Michel Foucault, Accelerationist"
UPDATE 2: Zamora replies here. As some readers may recall (see this blog post with a tentative abstract -- almost 2 years ago! ), I am working on a paper on the methodology of conceptual genealogy, which is the methodology that has thus far informed much of my work on the history and philosophy of logic. Since many people have expressed interest in this project, in the next couple of days I will post the sections of the paper that I've already written. Feedback is most welcome! Today I post Part I, on the traditionally a-historical conception of philosophy of analytic philosophers. Tomorrow I will post Part II.1, on Nietzschean genealogy; on Thursday and Friday I will post Part II.2, on the historicity of philosophical concepts, in two installments. Nietzsche’s innovation prompted a huge cultural shift towards subversive genealogical thinking – what might be called the ‘Genealogical Turn’ – including Freudian analysis, 20th-century Marxism, Foucault’s historical epistemology, certain strands of postcolonial and feminist theory, and much of what goes by the label ‘postmodernism’. These ideological programmes operate by purporting to unmask the shameful origins – in violence, sexual repression, gender or racial hegemony and economic and social oppression – of our concepts, beliefs and political structures. 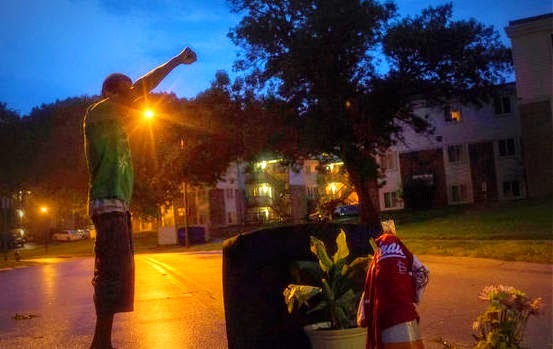 We continue awaiting the decision of a grand jury on whether or not to indict Darren Wilson, a white police officer, who shot and killed Michael Brown, an unarmed black teenager, exactly 15 weeks ago today on a suburban street in Ferguson, Missouri. News reporters from across the globe have been camped out in Ferguson for months, their expectation of an announcement teased and disappointed several times in the last week alone. On Monday, Missouri Governor Jay Nixon declared a state of emergency and activated the National Guard in advance of the grand jury's decision. Yesterday, President Barack Obama, in what can only be judged to be an anticipation of Wilson's non-indictment, preemptively urged protesters not to use Ferguson as an "excuse for violence." In the meantime, demonstrators of various ilk remain on standby, rallying their troops, refining their organizational strategies, painting their oppositional signs, standing vigilantly at the ready for whatever may come. But what are we waiting for, really, as we wait for Ferguson? As I’ve suggested here before, one of the undertheorized aspects of biopower is the relation between biopower and the juridical power it supposedly supplants. Now, I think it’s a mistake to think that biopower simply replaces juridical power, at least not on Foucault’s considered view (for the sorts of reasons given in papers such as this one; nor do I think the relation should be read that way, whatever Foucault thought), but to say that is to then pose a problem concerning their interrelations.